Chad Johnson or Niklas Svedberg? Who Has the Upper Hand? With last season’s backup Anton Khudobin leaving for the Carolina Hurricanes, it certainly left a pretty big void in the Bruins’ goaltending corps. Khudobin played pretty well in relief of Tuukka Rask, going 9-4-1 and a GAA of 2.32. He was surprisingly good for the Bruins this past season. That is all in the past now. The ‘Canes have him and now the Bruins have some question marks on who exactly will backup Tuukka Rask. It’s more or less down to two guys, Chad Johnson and Niklas Svedberg. Both players look like downgrades from Khudobin, but who is the better player and can help the Bruins win now? Chad Johnson is coming over from the Phoenix Coyotes where he spent most of last season with the team’s AHL affiliate, the Portland Pirates. Johnson only played in four games with the Coyotes, going 2-0-2, but it was a different story with the Pirates. Johnson only went 16-15-1 with a GAA of 3. He faltered in the Calder Cup playoffs losing all three games he appeared in with a GAA of 3.53 and a save percentage of 89%. Simply put, Johnson isn’t Khudobin. Although, Johnson did show flashes of brilliance this past season with the Coyotes, recording his first career shutout against the Nashville Predators. 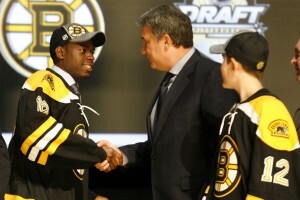 One thing in Johnson’s favor is that the Bruins signed him to a one-way contract. It doesn’t lock him into the backup spot in Boston, but it doesn’t hurt. On the other hand, Niklas Svedberg is a very talented, young goaltender. He was one of the top goalies in the AHL where he recorded a GAA of 2.17 and a save percentage of .925. Although he had a poor showing in the Calder Cup playoffs, Svedberg was expected to be Rask’s backup when Khudobin high tailed it down south. This was Svedberg’s first season playing North American hockey, but had played four seasons in the Swedish Elite League. The job appeared to be his until the Bruins signed Chad Johnson. Chad Johnson would be the better choice fiscally. Johnson is only worth $600,000 on a one way deal whereas Svedberg is worth $1 million on a two way deal. However, if Johnson struggles in Boston, you’d have to think that the Bruins could afford to bring up Svedberg. If Svedberg puts up the same numbers he did last year with Providence, the Bruins have to call him up to the big leagues. In terms of NHL experience, Johnson has a slight edge. Chad Johnson only has ten games NHL experience, but Svedberg has never played in an NHL game. Still with only ten games between the two players duking it out, there should be cause for concern. Playing for a big market team that is a contender year in and year out, it is hard to just come in as a green goaltender. It appears as if Johnson has the edge if it’s based solely on NHL experience, but Svedberg has to start somewhere. Svedberg is the more talented of the two and will probably get some experience with the Bruins eventually. I think the Bruins should give Svedberg a shot a proving himself between the pipes in Boston. It was really a mind boggling move as to why they signed Chad Johnson, unless the Bruins know something about Svedberg that we don’t. Maybe, the Bruins just don’t feel too confident in putting Svedberg in Boston, opting for another year of seasoning in Providence. The wild card in all of this is Malcolm Subban. Subban is only 19 and pretty much a dark horse at this point. It would be extremely unlikely if Subban vaults from the OHL straight to the NHL, but stranger things have happened. Subban will likely start the season in Providence backing up Niklas Svedberg. The Boston Bruins will probably go with Chad Johnson as the backup simply because he has more experience and would come cheaper than Svedberg. However, I do think Svedberg does make a couple of appearances in Boston this year and we’ll finally see just how well he does. The NHL regular season schedule was released on Friday. Check out our partners at TiqIQ for the best deals on Boston Bruins tickets for all 2013-14 games.